How to travel hand-luggage only! With a few tips and a little self-control, you can lighten your travel load to just hand-luggage. 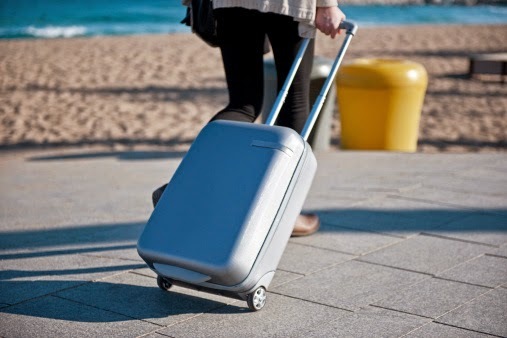 Imagine packing so light you can skip the long check-in lines at the airport, since you don’t have any bags to check. Walking through the airport would be a breeze, and finding an overhead bin once on your plane would be simple. Arriving at your destination, there would be no need to play the waiting game with the luggage carousel. You’d be well on your way before the first checked bags even hit the belt. Whether you opt for a backpack, duffle bag or a small suitcase, your hand-luggage defines how much you can bring on board. You also want a bag that’s easy to carry when you’re rushing through terminals and easy to manoeuvre when you’re trying to place it in an overhead bin or under your seat. More cases are now built with the budget airline limits in mind, and buying them is often cheaper than baggage charges. You can usually stuff more into these than hard cases, as they have a little more give. Start by packing clothes can you easily mix and match for multiple wears, rather than a dress shirt that will only get one wear at most. If you can keep shoes to the pair you’re wearing, great. If not, limit your shoe wardrobe to two distinct pairs to cover most occasions. Always weigh your case at home before you travel. Many pound stores will sell travel scales that can be used to weigh your luggage before you fly – also handy on the way back. Don’t waste your precious hand-luggage space with bulky books or magazines. Instead, bring a gadget that acts as your e-reader and more. A Kindle or iPad not only lets you bring an immense collection of travel guides and trashy novels to read on the beach, but these tablets also offer access to email and internet, meaning you can leave your heavy laptop at home. If you’re travelling for three weeks, do you really need to bring toothpaste, mouthwash, shampoo and conditioner for the entire trip? Or could you easily pack a day’s supply and then buy said toiletries after you arrive? Before putting anything in your hand-luggage, ask yourself if you really need it or if you’re packing it just in case. Stick with what you really need and you’ll see your travel load lighten up immensely! Many people jet home from a holiday with more than they took. If that’s you, ensure you leave space in your luggage for some souvenirs and fun bits. Protect your belongings with travel insurance and personal possessions insurance from Discount Insurance; get an instant quote today.